I love a good danish, then again I love anything to do with pastry in any shape, way or form. But during the week I really don't have time to sit in the kitchen for long hours, so my meals are all super fast and easy to throw together. 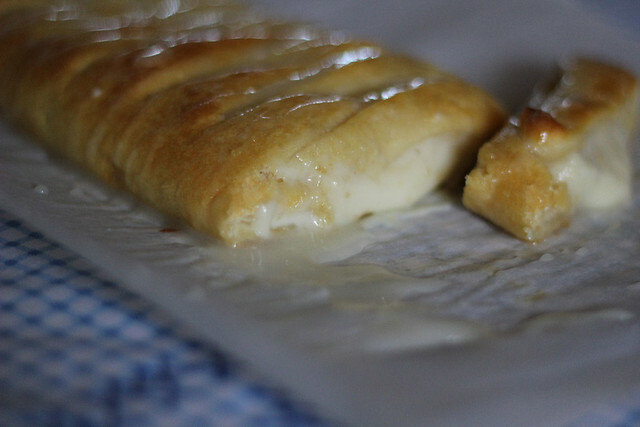 These Cream Cheese danish knock offs actually came about a few years ago when I was getting my menus ready and while looking through the fridge I saw a tube of crescent rolls and a box of cream cheese which were both about to expire. 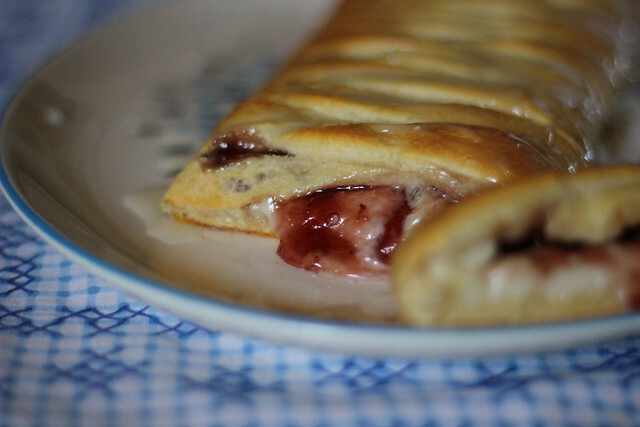 Usually, I would go for the Cherry Cheese Coffee Cake from Pampered Chef, but I didn't have the canned cherries and I was thinking about a braided cream cheese danish. This is what came of it and since then it's my go to dessert when we have family or friends visiting. The recipe below makes two Danish....I like to always make a plain cream cheese and then another one with fruit, you can do peach, apple, blueberries, you can use Jam etc. 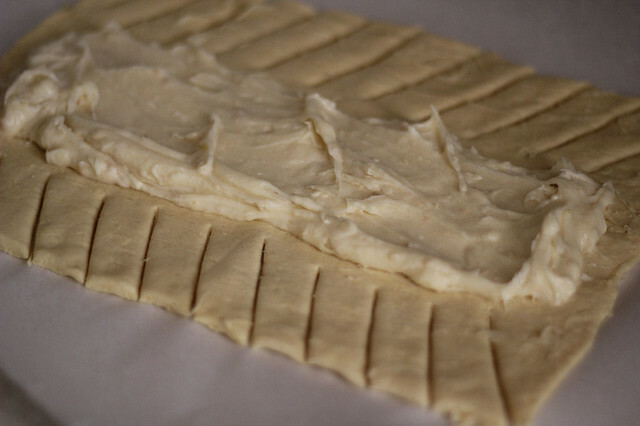 Open up the tubes of crescent dough and lay them on a parchment paper lined cookie sheet. I can usually fit both on one sheet to bake but when I'm first getting them assembled, I do one on the sheet and another on a different sheet of parchment paper on the counter. 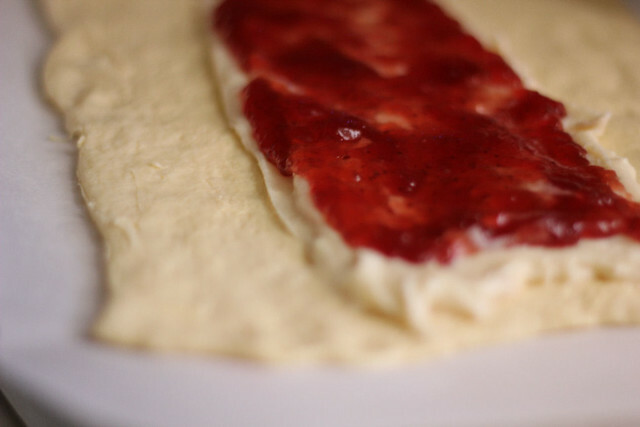 In a bowl mix the cream cheese, the sugar, the vanilla extract and the flour. 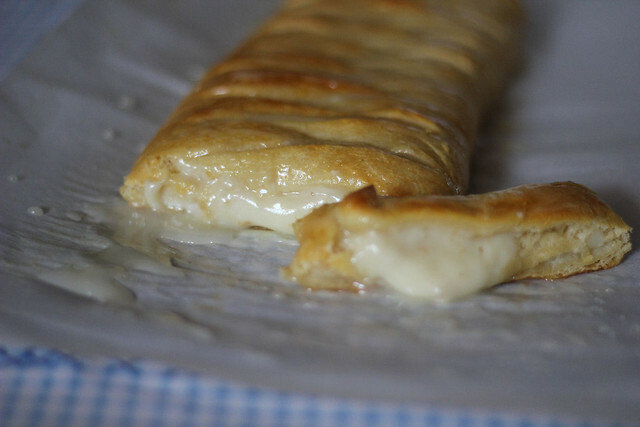 Then take about 3/4 of the filling and spoon onto the middle of the dough. Spread nicely, but keep it all in the middle. Grab whatever fruit you want to use, I would recommend the Lucky Leaf Pie Fillings which are really good. But this time I am using Strawberry Jam. Spoon some onto the cream cheese and spread it over. 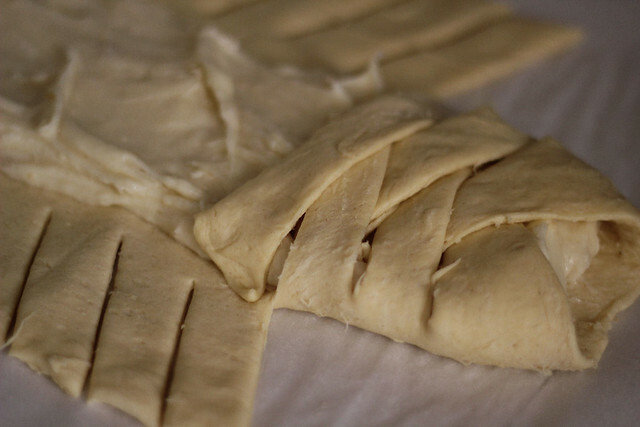 Then take a knife and make slit, about a half inch wide at a slant, all the way up the sides, then all you're going to do is take them and cross them over each other, kind of braiding. Fit both the Danish into the cookie sheet. I just grab the second one by the parchment paper and place it on the cookie sheet next to the other, you can cut the excess paper off. 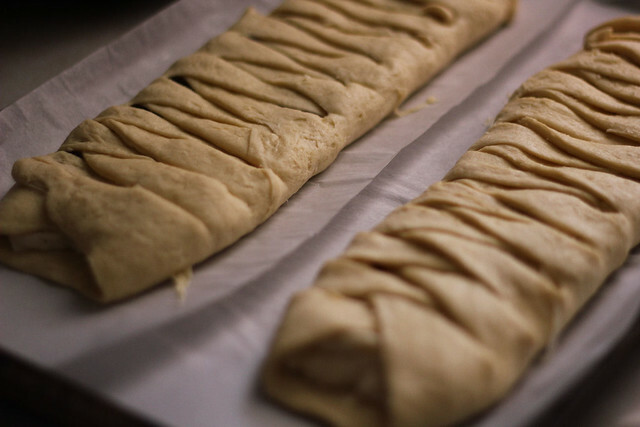 Bake them for about 20 to 30 minutes until the dough is done and nice and brown. Remove from oven and let it cook completely. Plain Cream Cheese, though there's nothing plain about it, I always forget just how good these are until I bite into one. 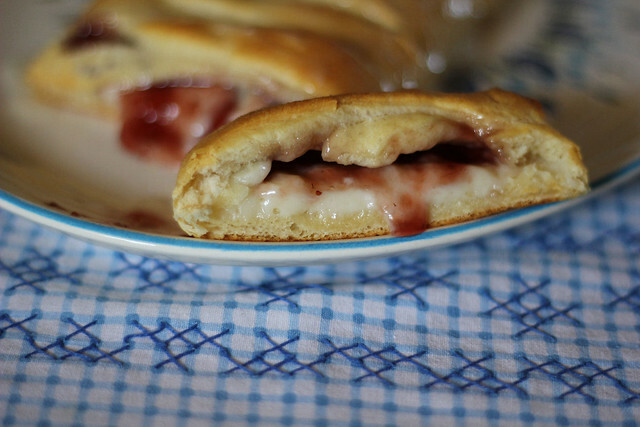 And here's the Cream Cheese and Strawberry Jam Danish....soooooo good. You are brilliant! 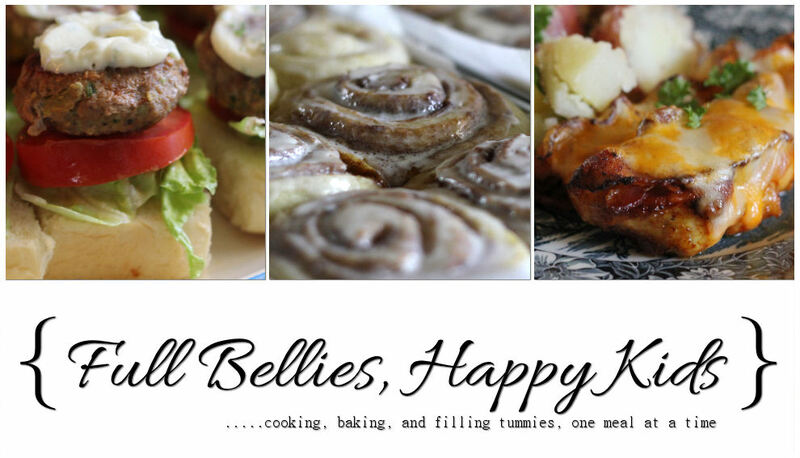 Thanks for posting - I've pinned it! Oh my gosh, I can hardly wait to try this. What a great thing to have with coffee in the mornings. This recipe looks really easy! My family love fruity pastries and strawberries are one of our favorites. I’m thinking of adding some nuts, will that be okay? 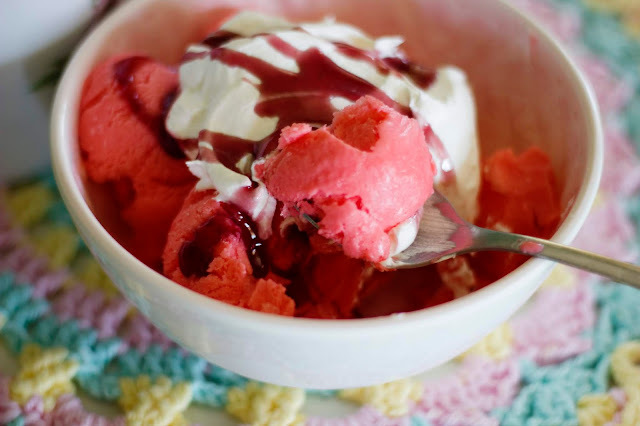 I think I can also serve this for my birthday, this is a sweet treat! Anyway, thank you for this easy wonderful recipe.